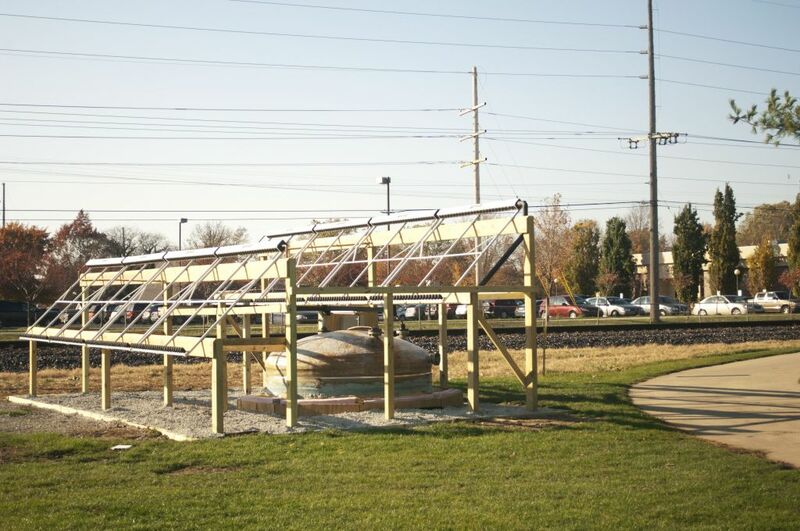 The SunShower Collector System is a student-driven and faculty-supported project that harnesses solar energy to heat the shower water in the Recreation-Fitness Center (RFC) at Goshen College. 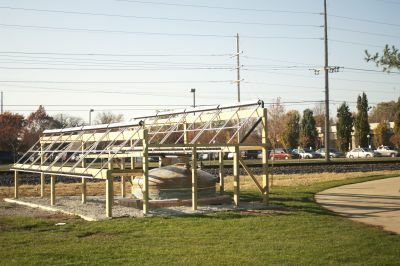 The unique system was designed by GC physics students and faculty members and built with the help of local contractors. Students are currently researching the properties of thermal heat transfer utilizing data from the collector system. 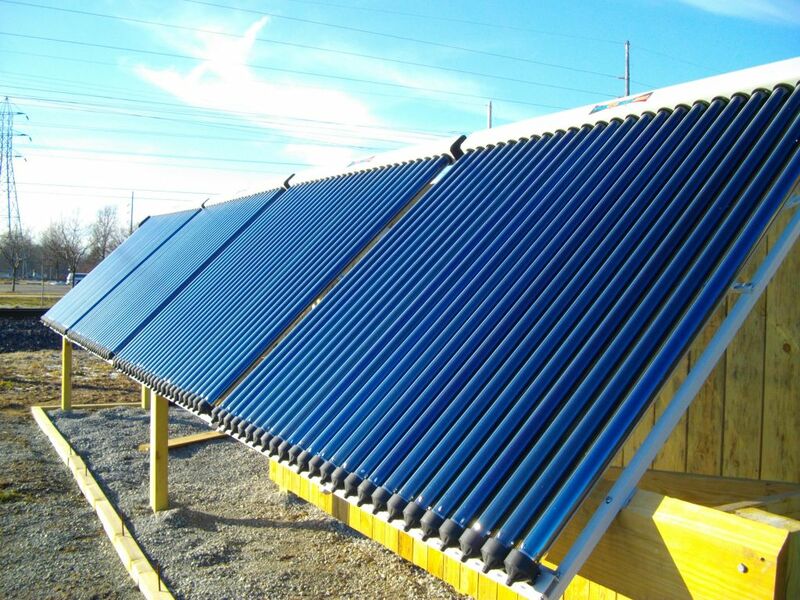 The project began as a simple idea: to use the sun’s energy to heat water at the RFC. The project would reduce the college’s carbon footprint by using less natural gas. 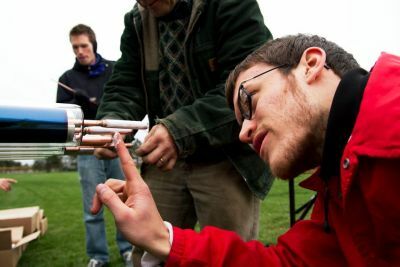 A small group of students, faculty and staff members began researching different designs in the fall of 2008. The group experimented with different methods of thermal transfer and laid important groundwork on the project. 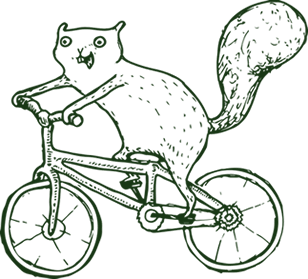 Over the next few years, students documented, organized and verified the original findings, and the final project design was chosen in 2010. Students and professors jointly wrote an official project proposal to the Economic Stewardship Committee (ESC) and President’s Council, and received the go ahead, as well as a matching grant from the ESC. This grant matched private funds that were donated to the project. 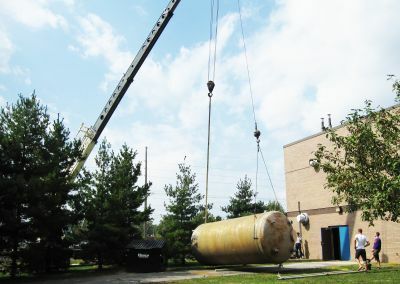 Construction on the project began in the fall of 2011, with the students and a local carpenter constructing a large wooden structure to encircle the heat storage tank. A 12-foot hole was dug, and the wooden structure and heat storage tank were lowered into the hole. High R-value insulation was inserted between the wooden structure and the tank to form an insulating cocoon. The tank and wooden structure were back-filled and a support structure for the solar collectors was built. A local plumber installed all the necessary items and insulated the water lines. Another contractor used directional boring equipment to connect electrical, hot and cold water lines from the solar collector site to the building. 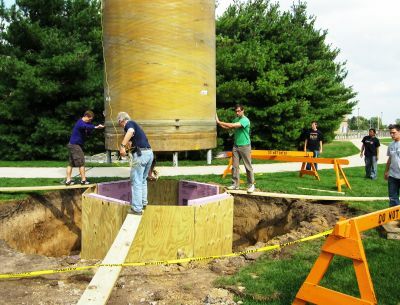 Once the structure was built and plumbing finished, the entire campus community was invited to join the group in assembling and installing the 200 individual tubes. A wooden fence was installed and additional foam insulation was sprayed on the above-ground portion of the heat storage tank. Over 30 different people helped install the tubes, and the system was put into operation in January of 2011. The SunShower Collector System is now operational and currently harvesting the sun’s energy to help to heat the shower water at the RFC. Optimization of the control protocols continued into 2012, and further observation and data collection will be an integral part of future students’ research on the project and on thermal heat transfer.